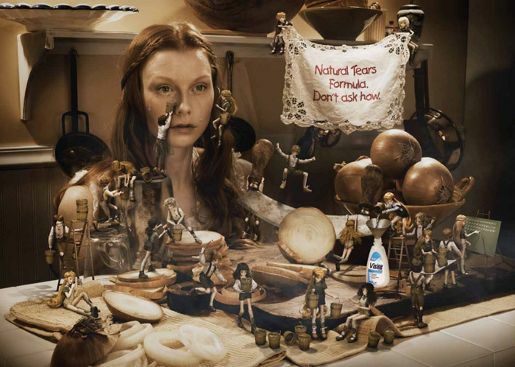 Johnson & Johnson Visine eye drops are presented as natural tears in this print advertising campaign. Women are provoked into shedding their tears in the kitchen, bedroom, at the movies. Visine Dry Eye Relief Natural Tears Formula Lubricant Eye Drops. “Natural Tears Formula. Don’t Ask How”. The Natural Tears campaign was developed at JWT New York by executive creative directors Andrew Clarke and Kash Sree, creative director Raphael Milczarek, copywriter Humberto Jiron, director of art buying Shawn Smith, art buyer Carly Chappell, print producer Jena Mattison, account director Susan Bratteson, account executive Heather Maclary, project manager Steven Marchione. The print ads were produced at Sweet Genius by producer Tonya Martin, with illustrator Aaron Padin and photographer Hans Starck (Grosser Fotografen).